This Alan Stuart Engineering Keg Barrel Hand Trolley can either have a pneumatic 10” tyre or puncture proof tyre. This Keg Barrel Trolley truck is especially made for the brewery industry and it has a height adjustable latch to hold kegs in place. The carrying capacity of this keg barrel hand trolley is: one 22 gallon with an 11 gallon keg on the top. 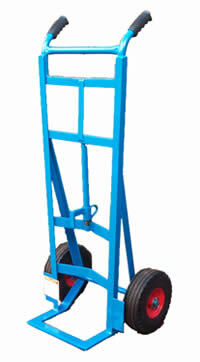 For more information on Keg Barrel Hand Trolleys and Keg Barrel Hand Trucks please contact us.